Once you know these things scroll down to our ultimate list of fifteen ukulele accessories that every ukuleleist should own! Why you need it: Number one on the list of ukulele must-have ukulele accessories is a quality tuner. While tuning apps are cool in a pinch, they don’t tune to the precision that a dedicated device like the Snark SN6X does. Clip this thing onto your uke’s headstock then switch it on and start strumming each string. The display will help you hone in until your sound is at the perfect pitch. 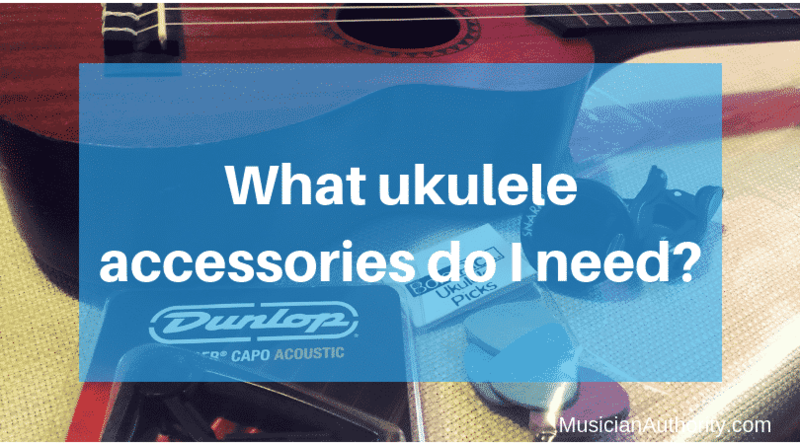 Why you need it: Ask anyone the single thing you absolutely need to have when you become a ukulele owner and it’s going to be a sturdy, protective gig bag. This light blue one by Hot Seal has a leather carrying handle or straps if you prefer to wear it, and a seperate front zipper to store your tuner, capo and cleaning tools when you’re travelling. Plus, it comes in three different sizes so you can pick the one that fits your specific ukulele best. Why you need it: Although you don’t have to play your ukulele with a pick, as a matter of preference, they’re one of the best ukulele accessories to have around, especially when you want to mellow out the sound and give your tunes a dreamy quality. BoloPick’s six pack of felt picks for ukuleles are sturdy enough to withstand regular play but have enough give to strum out soft melodies. Why you need it: Do you NEED a handcrafted ribbon ukulele lei to become a great ukulele player? Uh, probably not. Will it make you super happy and warm the hearts of all who watch you play? Absolutely. Etsy seller Ukuhappy’s collection of leis inspired by plumeria and hibiscus flowers comes in a rainbow of colors that, when placed at the top of your uke neck, will infuse your songs with a bit of the tropics from which the instrument was born. Why you need it: For those of us starting out on the uke or who just need a reminder every once in awhile, note decals are a really handy ukulele accessory. With this fret map you’ll use tweezers to place the removable stickers along your fretboard so that as you learn to play along to your favorite tunes, you can easily find where each note rests along the neck. Why you need it: If you just can’t get used to the feel of a traditional neck strap then DIYing a shoulder version is easy with one of Rinastore’s kits which includes the hardware you’ll need to add a small button to the base of your instrument. Once that’s installed, lace up the linen strap and let your ukulele float along your chest while you strum away. Why you need it: If your uke goes with you everywhere then a proper identification tag is a must. This leather case tag from UkuleleMore on Etsy is a classy way to keep track of your instrument with room to jot down your name, address and phone number in case your ukulele wanders off on your many adventures together. Why you need it: Mugig’s genius instrument stand design is just two pieces of wood that fit together like a puzzle, creating a solid stand for your ukulele. Since it comes apart just as easily as it slips together, this is a must-have accessory for on-the-go musicians who don’t want to leave their uke just laying around between songs. With each piece measuring at less than a foot long, it’s easy to bring along to gigs or for displaying in small spaces. Why you need it: To keep your ukulele from cracking or warping when the seasons and temperatures change you definitely need to equip it with a humidifier when you’re not playing it. Oasis’ OH-18 unit is super light so it won’t damage the body or change the tuning when you hang it by the strings where it will then rest inside your uke for humidity control during storage. This particular set comes with a syringe which makes refilling it once a week super simple. Why you need it: If you’re just learning how to play the ukulele and haven’t broken your fingers in yet or you just really hate the sting of nylon digging into your skin after playing for awhile then finger guards are a solid way to avoid calluses. This set of silicone protectors comes in small, medium and large sizes so you can match to fit and keep those feelers sheltered from the pain of getting to know your strings. Why you need it: Sure, you can barr your chords with your good ol’ fashioned finger but it won’t be as pretty as Nordic’s line of sleek metal capos that come in metallic black, gold and bronze as well as matte silver and brown styles. Clip one on before strumming one of your favorite uke tunes and when you’re done you can slip it back into the pouch that makes this an awesome set to gift to yourself or another ukuleleist. Why you need it: Each musical niche seems to have products that have earned a cult following in their community and for uke players, one such must-have accessory is Aquila brand strings. The synthetic Nylgut material unique to Aquila is incredibly durable and hits the mark for everyone from amateurs to professionals. Besides soprano regular, the brand also offers sets for tenor, concert and baritone so every player can enjoy the sharp sounds whether they’re plucking or strumming away. Why you need it: For quick cleanups and dust-offs on the go, it’s nice to have something like The Nomad Tool to throw in your gig bag. It has two sides, one flat microfiber end so you can wipe down the body and reach under the hardware and a soft, natural fiber brush on the other side to gently cleanup your uke strings, around the pegs and in the crevices on the fretboard. Why you need it: Save your digits from the pain of changing out strings or replacing broken ones with your bare fingers by using a winder. The D’Addario Planet Waves Pro-Winder String Winder/Cutter is extra cool since it’s a combo tool so you’ll save room in your gig bag. Why you need it: When you think about it, you’re consistently exposing your ukulele to whatever is on your hands and clothes like lotions, sweat and fibers, so part of keeping your instrument in shape and playing smoothly is cleaning it up every so often. This Music Nomad set includes a streak-free cleaning formula to spray away any buildups, a microfiber suede cloth to gently wipe away dust and a conditioning oil to keep your uke’s wood nice and healthy.